StormRider was one of the original opening-day attractions at Tokyo DisneySea, and was located in Port Discovery. StormRider closed May 17, 2016, after an almost 15-year run. StormRider put you aboard an aircraft whose mission was to fly into the middle of a violent, potentially-destructive storm and dissipate the storm with a missile-shaped device called a "FUSE." The mission did not go smoothly however, as the FUSE device was struck by a bolt of lightning, causing it to veer off course and collide with the StormRider craft. What ensued was a wild ride and some special-effects surprises. At its core, StormRider was a full-motion-flight-simulator-based attraction, similar to Star Tours. StormRider went a step beyond Star Tours however, and introduced additional special effects including the FUSE missle crashing through the roof of the ride vehicle and "rain" entering the aircraft's cracked hull, spraying the riders with a light mist of water. Before embarking on your journey there was a live-action "pre-show" which introduced you to the aforementioned FUSE missile and gave you a rough idea of what to expect once aboard the aircraft. The pre-show (and your pilot's dialog aboard the aircraft) were in Japanese, although English subtitles could be provided by screens located in a select number of seats. This attraction was a lot of fun. The ride vehicles were large and held many more people than the Star Tours' vehicles, and the ride motion was smoother than Star Tours—although still pretty wild. The added special effects were immersive, enhancing the overall experience considerably. 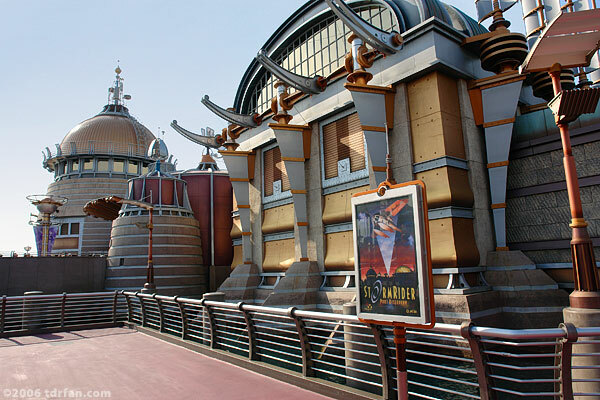 Although the core technology had previous been used in attractions at other Disney parks, the theme and experience of StormRider were unique to DisneySea. Postscript: StormRider was replaced by a Finding Dory-themed ride in May of 2017.